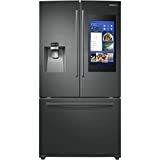 Whether you are building a new house or replacing an appliance that is past its prime, a Samsung French door refrigerator may be the solution you are looking for. With high-quality models to fit every budget, you are sure to find one right for you. There are smart appliances and some with or without external ice dispensers. This article looks at the top 10 models available in 2018. 1. How reputable is Samsung? Samsung is a top brand that has been around since 1938. It has a history that goes back to decades of being a leader in refrigerator manufacturing and sales. 2. Where can it be purchased? Many major retailers sell Samsung appliances including Home Depot, Best Buy and JCPenney. Many stores offer delivery for no extra charge. Price depends on the size and features you are looking to obtain. The models listed here run from $1099 to $3299. Since there are dozens of refrigerator models in Samsung’s line, it took some time to compile a list of the top 10. Each model was researched individually and reviewed for versatility, usability and practicality. Size and features played a considerable part in the rating process. In addition, online customer testimonials and reviews were examined. When looking at customer experience, we looked specifically for items that stood out as being either very good or below average in the reviews. This honest appraisal was created by open-minded reviewers with no prior bias. Each refrigerator is rated on a five-star rating scale. 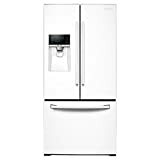 Refrigerators can vary greatly in price based on the size of internal storage and the features provided. Some models have exterior dispensers or smart displays while others do not. The models in this article cost between $1099 and $3299. The Samsung Model # RF23M8590SR 22.6 cu. ft. refrigerator was the clear leader of the pack. This item stands out because of the industry-leading feature of a 21.5-inch touchscreen Family Hub display built into the front of the product. The touchscreen allows you to create family lists and calendars, share photos and video, and even order food. An additional perk of the smart display is that it can keep up with expiration dates for you. If you are a tech guru, this is the smart refrigerator that you want. The Twin Cooling PlusTM technology allows the freezer to maintain low humidity for less chance of freezer burn. At the same time, the fresh food section can have higher humidity to keep perishables from drying out. The stainless-steel exterior looks sharp and has a special coating that helps resist fingerprints. Water and ice can be obtained at any time through the dispenser built into the door. Another smart option is the Samsung Model # RF265BEAESG. Just a tad bigger than the previous model, it includes many of the same features. In addition, it contains three built-in cameras that allow you to see what is in the refrigerator without opening the door. Easily take inventory of what’s on hand without letting all that precious cold air escape. The Wi-Fi enabled 21.5-inch touchpad on the front of the fridge helps you to make your grocery list, order food from local restaurants and post to-do lists for your family to complete. You can also listen to music through Pandora, display pictures from the family album or check the weather forecast. No refrigerator you have owned has ever been able to do more. If you are slightly intimidated by a smart appliance, Model # RF28JBEDBSR is the top of the line for standard options. 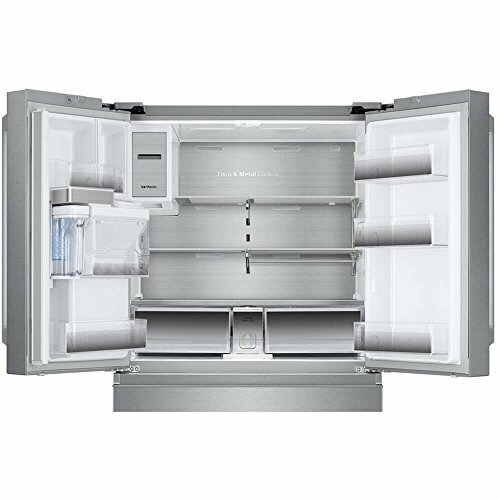 There is ample room for everything in this 27.8 cubic foot device which features all the bells and whistles you want to have in a refrigerator. It is metal cooled which allows it to maintain a consistent temperature that keeps food fresher longer. The classy styling of this model will accentuate any large kitchen. The top selling points for the model are the unique Food ShowCase door for quick access to frequently used items and the two fresh food drawers that are usable without opening the main doors. The interior contains tempered-glass, spill-proof shelves and door bins big enough to hold gallon jugs. Available in black stainless steel, the Model # RF22K9381SG provides and rich and classy touch to your kitchen décor. Triple cooling functionality allows you to have three different temperature zones in the same unit. The bottom right door opens to a section that can be used for fresh or frozen items. Don’t worry about someone leaving the door open as a door alarm notifies you if it is open too long. There is a child lock, so you can control when the refrigerator is accessed. The interior features tempered-glass shelves for strong support and easy cleaning. It may not have all the features of the previous models, but you won’t be disappointed in this possibility. This selection also comes with Twin Cooling PlusTM technology that helps to maintain maximum food freshness. Door bins are large enough to hold gallon containers which keeps valuable shelf space clear for other items. Fresh fruits and vegetables can be easily accessed through the separate pullout drawer. The large freezer drawer can easily accommodate all your freezing requirements. A little more compact model, this item stands out because of its triple cooling system. The unusual functionality allows you to switch the bottom right section from fresh food cooling to freezing, or vice versa, with a simple switch control. Another popular feature is the adjustable shelf that can be easily flipped up to make room for taller items. Two clear crisper drawers keep produce visible and within arm’s reach. If some of the above models are outside of your price range, you will likely be happy with the Model # RF26J7500WW. Still a very large option, it supplies light to almost every inch of the interior with high-efficiency LED side and top lights. The large freezer drawer rolls open at your voice command thanks to the automatic control. Fill your cup with crushed or cubed ice anytime with the exterior water and ice dispenser. It even monitors your water filter and tells you when it is time for it to be changed. This star player meets government specifications and is Energy Star Compliant. The Model # RF261BEAEWW is an economical model without an exterior ice and water dispenser. This large-capacity refrigerator makes life easier with quick to clean glass shelves and large door bins that can hold a gallon of milk. Fresh vegetables and fruit are kept in their ideal environment in the two crispers with humidity control. 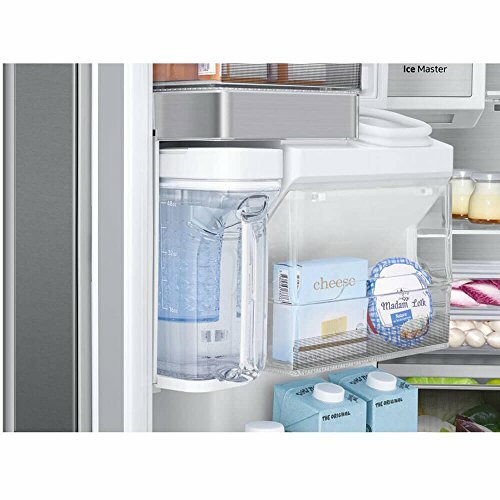 The built-in icemaker has a removable ice caddy making it easy to take the ice where you need it, and a helpful door alarm lets you know if the door has been open too long. You’ll never have to guess when your water filter needs to be changed because the interior dispenser also has a filter indicator. For another well-priced option, consider the Model # RF220NCTAWW. The smaller width makes it a better option for smaller kitchens or homes with less than standard-size exterior doors. Constant temperatures are maintained inside the unit with the surround air flow system. The freezer includes an ice maker, so you never have to worry about filling ice trays again. While this is a strong Samsung product, the lower price does forfeit some appealing options. This model does not have exterior dispensers, child locks or dual-cooling systems. That said, it is still a highly rated product with many stellar reviews. To finish out the list of top products is the Model # RF18HFENBSP-2. 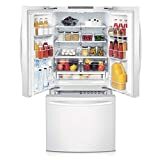 This considerably smaller option would be a good choice for apartments or a second refrigerator. There is plenty of room inside with the spill-proof glass shelves and gallon-size door bins. Cheese and lunchmeat are easily stored in the deli drawer that is designed to keep those products at the right temperature. 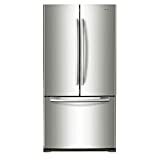 Not as flashy as some of the top models, it does have an icemaker built in and a freezer drawer that is easy to open. The two vegetable crispers are humidity controlled to keep produce fresh as long as possible. Samsung is a strong brand, and you cannot go wrong with any of the models listed above. Our favorite is the Model # RF23M8590SR because of the smart 21.5-inch LED display and unique functions. The ability to get the news headlines from a refrigerator was that extra splash of special that put it into first place. It didn’t hurt that it is a large-capacity product that looks sleek and stylish. Smart appliances may not be in line with everyone’s budget or preferences. It’s also important to remember that the size of the refrigerator must be examined for both the space it will fit into and the doors and hallways leading to that space. Be sure to think about what features are most important to you and then choose a model accordingly. 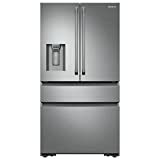 Next articleLG LFC24770ST: Is It the Best LG French Door Refrigerator Model?